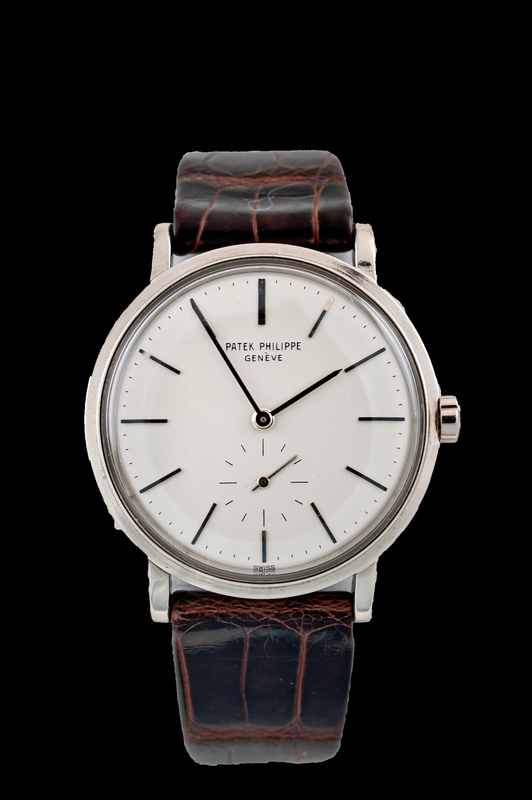 “This vintage Patek Philippe Calatrava watch is one of only three reference 3429s in white gold to ever appear in the market. Add to the rarity factor that the watch contains Patek Philippe’s best automatic winding caliber ever, and you have an extremely collectable wristwatch. This watch was produced in 1963. Original case is 18k white gold with dimensions of 35mm diameter by 9mm thick. The 18k gold case back is massive and screws into the case – one of Patek’s first highly water resistant watch cases. Crystal is acrylic. The bezel features stepped construction and the case finish is original and alternates between polished and brushed surfaces. Case is in mint plus condition. Original dial is untouched and also in mint plus, perfect condition. Silver in color, and with applied hour markers, subsidiary seconds dial, and baton style white gold hands, the dial is beautiful in its simplicity. Original Patek Philippe Caliber 27-460 is both an aesthetic and engineering marvel. The movement is rhodium plated, with 37 jewels, Gyromax balance that is adjusted to 5 positions, heat, cold, and isochronism, has a self-compensating free-sprung Breguet balance spring, and is double stamped with the Geneva Seal. There is a massive 18k yellow gold winding rotor engraved with the Calatrava Cross. Movement is in perfect condition and running strong.